Breakfast at my hotel (Villa Oudomlith), they serve variety of fresh fruits every day. Baguette, any style of egg and fresh juice are good taste too. Khai Phaen, Lao buffalo meat sausage, spicy soup and steamed rice are delicious. Their cake is not bad. Both locals and foreign tourists visit this noodle house. Lao noodle got influenced from Pho, the Vietnamese noodle, but all seasonings on the table are Thai brands. The simple food shop, running by the local, it is the wooden home of the owner where she arranges the front terrace for cooking and dinning space. Price is street food rate. 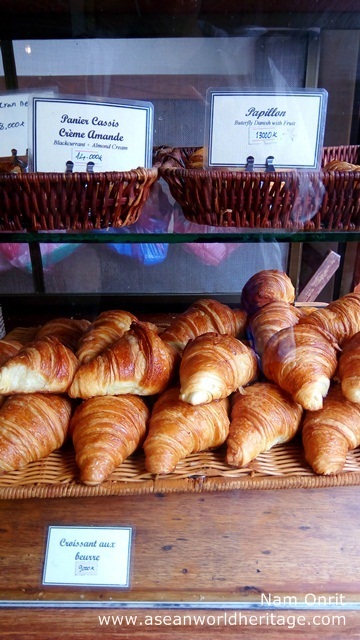 French café, serving sandwiches, croissants and other French bakery, there is a room for imported food from France. Pain au chocolate is divine. The coffee shop on Mekhong riverside, simple decoration with high quality local coffee beans, they brew them by the famous espresso machine. Joma Bakery is the famous coffee chain in Laos. They have first branch in the city centre of Luang Prabang in the colonial style building and the second branch on the quieter area along Khan riverside. It is beautiful wooden villa. Their staffs are attentive; food and coffee are good too.